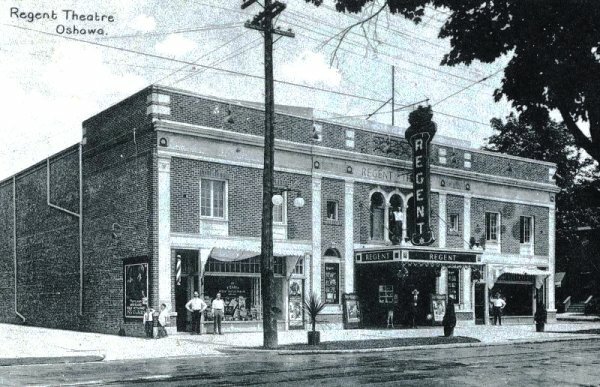 Construction of the Regent Theatre began in March 1919, and while the date of opening night is in dispute, some documents say it took place later the same year on October 16, 1919. The opening performance was “The Prince Chap” starring Thomas Meighan and a Mack Sennett comedy entitled “You Wouldn’t Believe It!” accompanied by a special orchestra which was personally directed by Jack Arthur. The building was designed by J. McNee Jeffrey, a famous Canadian theatre designer, and was officially opened by Oshawa Mayor John Stacey. In attendance were N.L. Nathanson Managing Director, H.M. Thomas General Manager and George Barrows secretary-treasurer of the Famous Players theatre chain which commissioned the theatre’s construction. It was reported that a capacity audience attended and hundreds were turned away. It was reported in 1927, that the annual attendance at the theatre during the past fiscal year had reached over half a million people. As part of the Canadian Famous Player’s chain for most of its existence, the theatre obtained many of the best offerings of the film world. 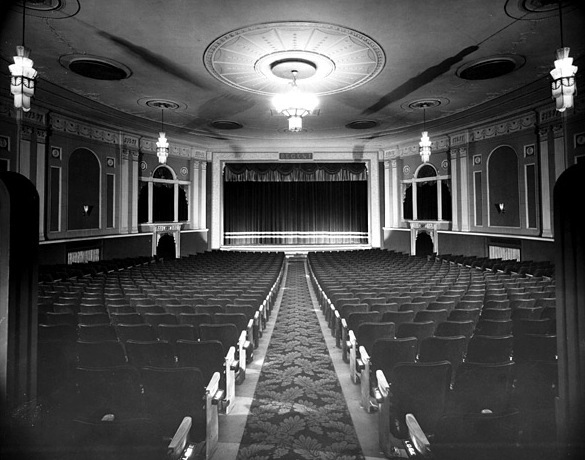 The theatre was constructed with many unique and innovative features for its time including an original air conditioning system which consisted of fans blowing air over blocks of ice placed in racks. This was replaced in the late 1920’s with a system that had cold water pumped through the building to provide a cooler atmosphere in the summer. 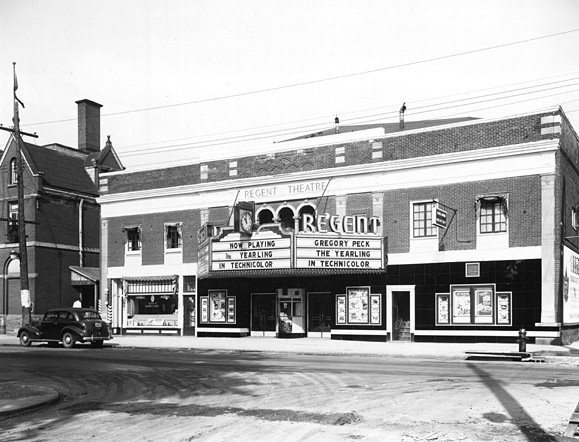 The Regent was also the first theatre in Oshawa to offer perfect vision to its 1,100 patrons. 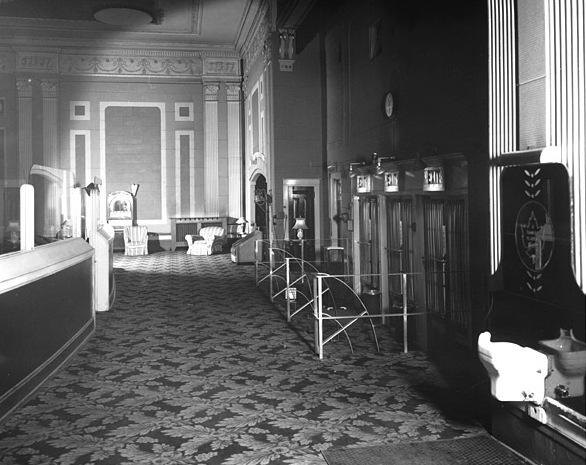 It was also reported that the theatre’s acoustical properties were considered outstanding, and the lighting system provided an atmosphere to enhance the movies shown on the screen. 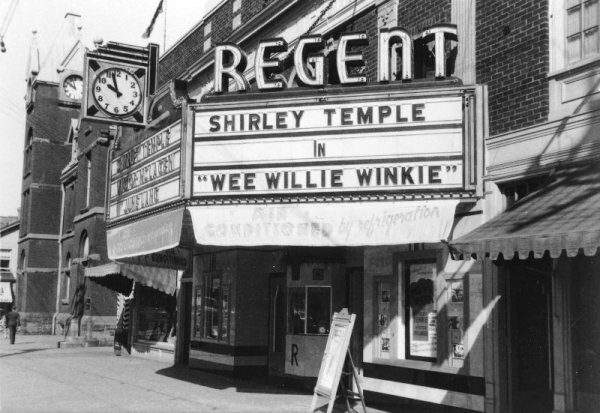 The Regent Theatre was constructed in 1919 by Norman McLeod Ltd, at a cost of $100,000. The King Street façade of the theatre was modelled on Georgian architectural lines and as such the architectural features are very symmetrical. The building is one of the few remaining examples in Oshawa of this classically inspired architectural style. The building featured three main components on its front façade: the theatre entrance in the middle with a traditional commercial storefront on either side. The first Regent Theatre sign was vertical in design and was suspended from a bracket mechanism on the roof. Below the sign was a square canopy suspended from the front wall by chains (the wall hooks still remain). The original canopy and sign were replaced c.1950 by a Famous Players movie theatre marquee that allowed films to be advertised using large metal letters. On either side of theatre entrance were round arched display windows used to advertise attractions (now house digital screens). Located above each original storefront were two sets of elongated casement windows each with eight panes of glass and decorative bottom panel. The name “Regent Theatre” was inscribed in the frieze above the central arcade and still exists today. The building’s framing is built entirely of steel including the ceiling structure, and the exterior of the building is clad in red brick. The exterior treatment of the lower portion of the front façade has been altered a number of times. At one time, the original brick was covered with black tile with turquois trim (1950-60s). The upper portion of the front façade has many of its original details intact. There is a classically inspired frieze complete with egg and dart moulding, pilasters with wreath decorations, a three part round arcade with Corinthian columns and decorative keystones. The brickwork has decorative banding and stone quoins at the corners. There is also interesting brickwork around the windows consisting of a flat arch of vertical stretchers and four headers at the corners which form squares. The arcade on the building is mirrored in the Alger Building (1928) located across the street at 35-37 King Street East. 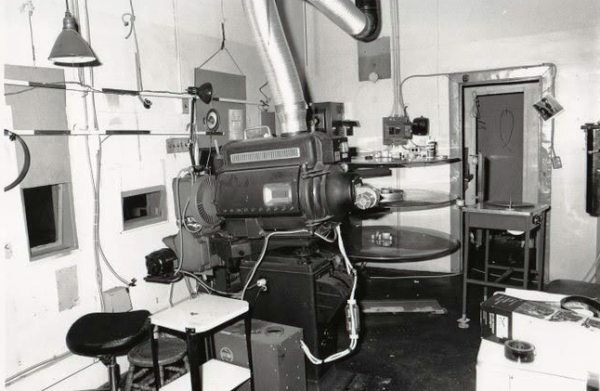 When the theatre was first built, the moving picture industry was in its infancy and the owners were concerned that the movies could be a fad. To prevent this from being a problem, the theatre was built with extra heavy foundation to support a fly tower that still exists to accommodate props and a stage that measures 36 feet wide by 22 feet deep was installed along with an orchestra pit. 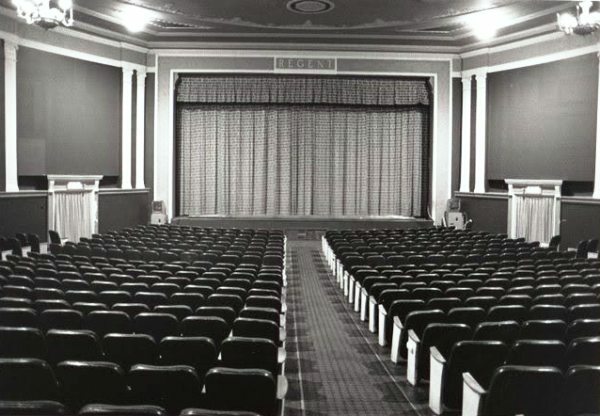 The original movie screen could be moved to the back of the stage when the venue called for live entertainment. 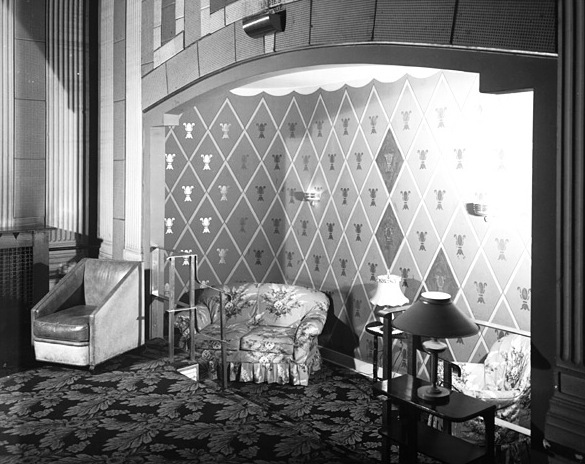 The theatre also had a double basement for the installation of dressing rooms and prop storage area. The auditorium is equipped with five decorative chandeliers which resemble bowls with arms reaching up to hold candles. These are not the original chandeliers, which were made of frosted plate glass, and it is assumed that they were replaced sometime in the 1950’s. The ornate plaster detailing on the ceiling consisted of medallions representing mythological subjects. The layout of the five chandeliers consists of four smaller chandeliers arranged in a circle following the curve of the building’s roof around a fifth larger chandelier in the middle of the auditorium. All of the chandeliers are topped off with medallions that are linked together and surrounded by a larger ring around the curve. 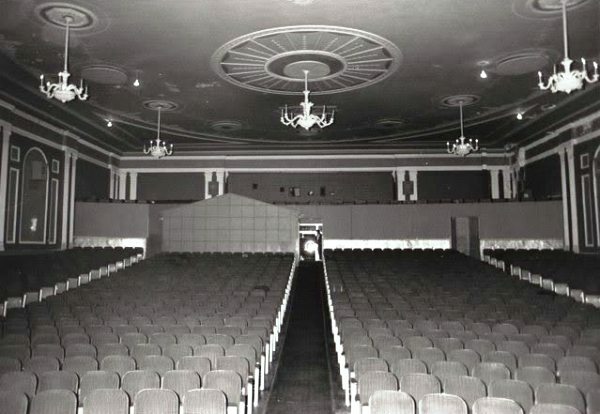 The entire perimeter of the auditorium was decorated with a rope like moulding and the vents in each corner of the auditorium were detailed with similar plaster ornamentation that compliments the entire ceiling. In the summer of 2013, the University of Ontario Institute of Technology (owner of the Regent Theatre since 2009) commissioned the complete replacement of the ceiling structure and re-creation of the original historical plaster mouldings which are now decorated in blue and gold. under the Ontario Heritage Act.